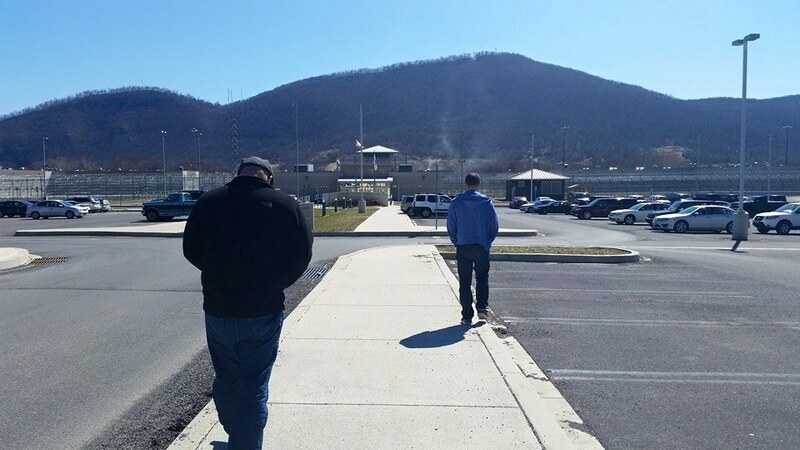 Yusuf and hubby walk to Adnan's prison. On Sunday I visited Adnan after a very long time – at least four months. Since he was moved to Cumberland six years ago, it’s been difficult for anyone, including his family, to see him often. The trip takes most of the day going back and forth and the past few months have been a tornado of busy-ness related to Adnan’s case, my work projects coming to a head, travel, moving, and generally just trying to keep it together. Frankly, I’ve been treading water. Barely. So in all of this, the talks about Adnan’s case, the blogging, the media, etc, Adnan himself got kind of lost. Last week I pulled out some of his old letters to remind myself of what this is all about and decided it was time to get to Cumberland. I went with hubby and Yusuf, Adnan’s brother. Visits don’t last long, about an hour, and it was an hour that sped by. We talked about new developments in his case and the upcoming hearing, and true to form he messed with us, joking about stuff to get us out our sober moods. Its hard not to feel sober when I see him, by the time we get through half a dozen security measures and enter the room where we sit divided by a short glass wall, I already feel crappy. When I see his DOC issued clothing and how he has to ask guards about every single thing he does, before sitting, standing up, moving to another part of the room, it breaks my heart. From the day he was dragged out of bed at 17 until today, he has not had the ability to walk from one room to another without someone else’s approval. It is an undignified loss of freedom, which is how we treat our prisoners. They’re less than human trash, they’re collateral damage in a wholly inhumane prison industrial complex that the average American doesn’t think twice about. If you think I’m being a bleeding heart liberal, then go ahead and consider that we incarcerate more people than anyone in the world, at higher rates per capita than any country in the world, and impose harsher sentences than any country in the Western hemisphere. One in nine inmates in the US is serving a life sentence. Unconscionable. Consider the billions made on the backs of inmates, who are tiny little cogs in the wheels of a massively profitable industry. That should not sit well with anyone. 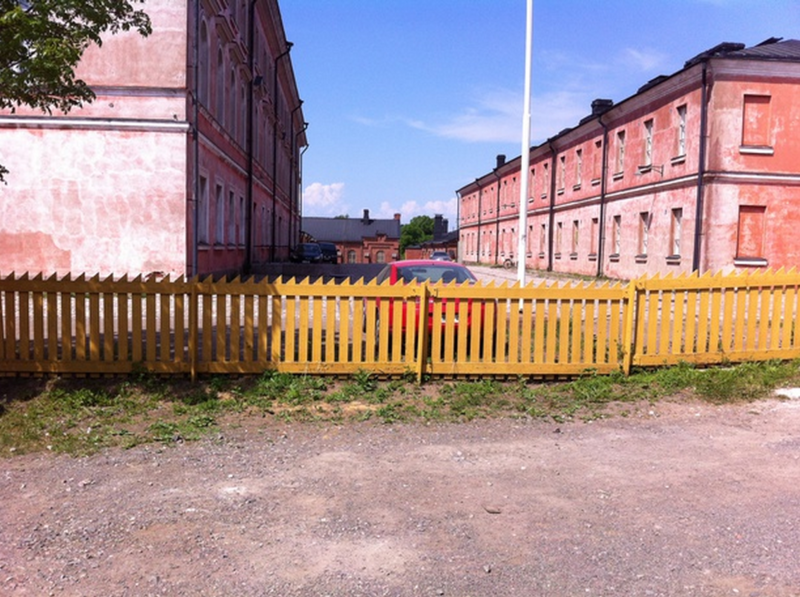 Compare it with the open prisons of Scandinavian countries, where corrections officers serve in both rehabilitative capacities as well as security roles, inmates can earn decent wages working in the town, can spend time with family, and be as prepared as possible to return to life with other citizens. Our broken system breaks people further, while open prisons heal them. It is, therefore, amazing to me that Adnan maintained his sense of decency and dignity in all of these years. He didn’t get broken. During our visit with Adnan we discussed the recent lawsuit filed by Sabien Burgess, a man wrongfully convicted in 1995 in Baltimore, who is alleging deliberate police misconduct and fabrication of forensic evidence . Two of those individuals named in his lawsuit happen to be detectives that worked in Adnan’s case – Ritz and Lehman. This is the second lawsuit against Detective William Ritz alleging misconduct that resulted in a wrongful conviction. Is it any wonder that I worry, just a bit, about testing the physical evidence for DNA that the police have had in their custody for 16 years? I don’t want to be a cynic, I want to trust the system, I want to trust our police and prosecutors, but it’s become really really hard. It turns out that Adnan knows Sabien, they had been housed together many years ago before they were sent to separate prisons. Sabien is also a Muslim, so they connected over their faith, and according to Adnan, he’s a good and kind person. Sabien lost 19 years of his life thanks to the crooked work of detectives involved – he can never be given back those years, but I hope he is given some sort of restitution. On the way out after seeing Adnan, an officer stationed at the front desk asked us how our visit went. We told him it went well and he said “I know him, he’s a good guy. Very respectful”. Then he looked over his shoulder, leaned forward and whispered, “One of the most respectful people I’ve ever met”. It’s no small feat to have such a reputation in a place like that. 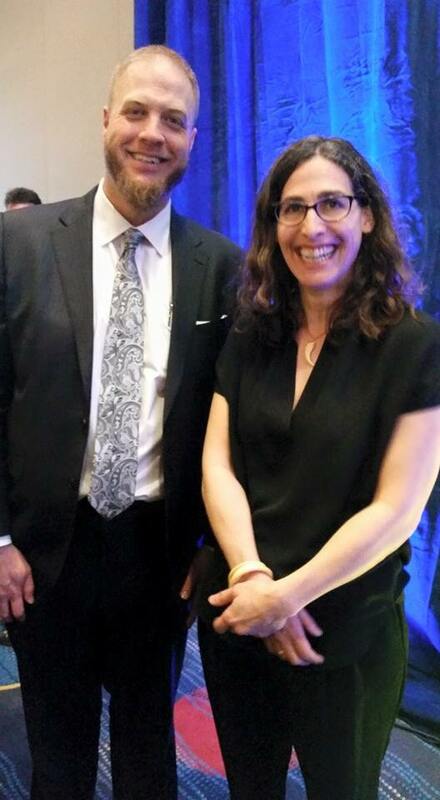 Last week I saw Sarah Koenig after quite a while. I had the pleasure of attending an awards gala thrown annually by MPAC, the Muslim Public Affairs Council, which works on policy issues that impact Muslims in the US. At this gala they recognize individuals who have made an impact on the lives of others and given voices to those who are marginalized. This year they honored Sarah, the Secretary of Homeland Security Jeh Johnson, Senator Patrick Leahy, and civil rights legend Rep. John Lewis. I had known about her award for a couple of months before hand, the director of MPAC being a friend and colleague, and was thrilled that the Muslim community was recognizing the work of Serial and Sarah in humanizing Muslims, something we’ve failed pretty miserably at since 9/11. 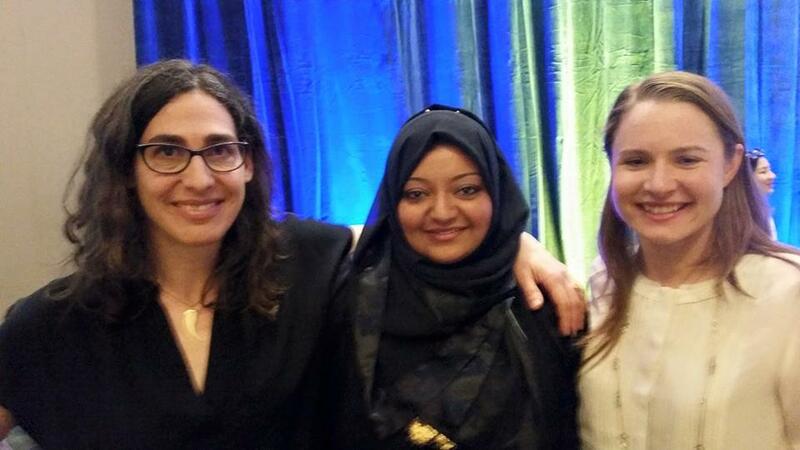 I have to admit, it was kind of strange for me to see my worlds collide – many prominent Muslims from the DC area, friends, and Sarah and Dana all in the same space. It was weird. But it felt good. I look drunk. But I am not. Here is where it got super weird for me. One of the best know Imams in the America, Imam Suhaib Webb, asked me take his pic with Sarah. Twilight zone level colliding of worlds. Sarah gave a lovely and gracious acceptance speech. If I haven’t expressed enough how grateful I am to her and the entire Serial team, even given the times when we didn’t see eye to eye, for literally bringing this case back from the dead, let me do so emphatically now. We would be nowhere, and would have had no glimmer of hope for Adnan, without them. Without their masterful storytelling, without the hundreds of hours they put in, without them giving Adnan a chance. You should have seen my face when I got this message. Ok, for like two days I thought it was the wife of the actual Chris Rock, but um, it wasn’t. Lucky for me that it wasn’t because I desperately needed this Chris Rock and his wife Dez in my life. You see, they are the proprietors of Kustodian, an internet security firm. Check out the website and tremble in fear, hackers of the world. There you have it. Dez said he had to. So he did. And now they tell me every time some loser tries to hack into my blog. Hey, you over there in Italy, give it up already. You will not succeed. Then there is Nya, an amazing and enterprising 13 year old who has taken up the cause to help raise funds for Adnan. Nya designed and sold t-shirts completely on her own, giving 100% of the proceeds to Adnan’s legal fund – and she is now organizing a fundraising dinner for him up in Massachusetts. Nya’s t-shirts – sorry folks, they’re gone now! 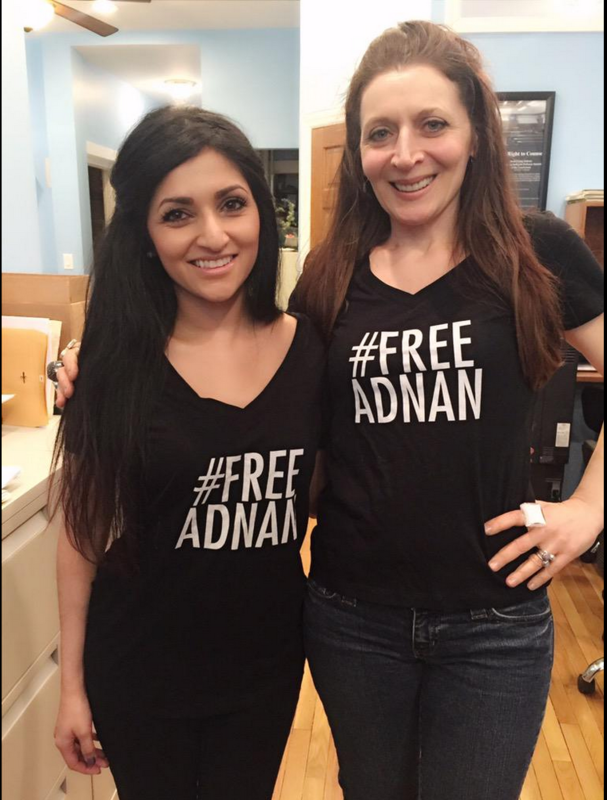 There is Rene, who blogs at www.blackgirllostkeys.com, and has done a series of beautiful posts on Adnan. She’s made me cry more than once. She also did the amazing thing of experimenting with hijab and writing about it. Her writing is a like a big warm hug and she’s a beautiful human being. 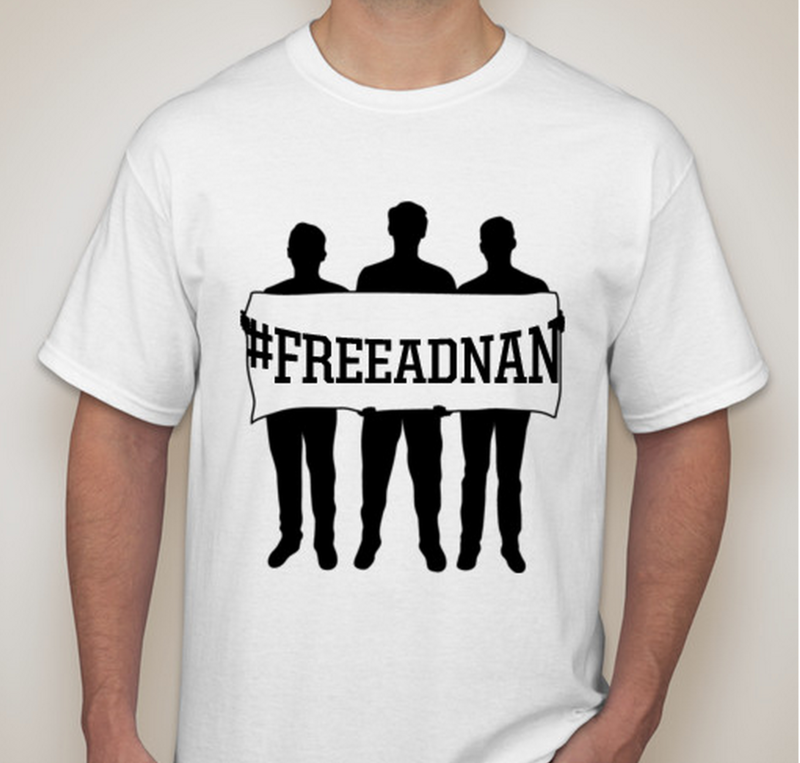 There is an entire group in New York, Jia, Marion, and Farah, who are organizing a fundraising benefit concert for Adnan and also selling t-shirts, 100% of proceeds again going to his legal defense fund. Here is the press release for the benefit event (go if you’re in New York! ), and here is where you can buy their very cool t-shirts. Jia is a fashion designer and CEO of Studio15, a company that creates beautiful clothing you design yourself, and Marion is musician who has written a song just for the benefit concert. Seriously. Jia and Marion, showing off their t-shirts and making them look great. You ladies are incredible. There are the attorneys who have volunteered to be part of Adnan’s legal trust. Dennis Robinson and Anne Deady, both incredibly busy and brilliant lawyers, are giving their time pro bono to manage Adnan’s legal trust. Believe me when I say it would have taken me another six months to figure out what they managed to pull together in a fraction of the time. Together they’ve been taking care of so many details that, left to my own devices, would have been impossible for me to do alone. 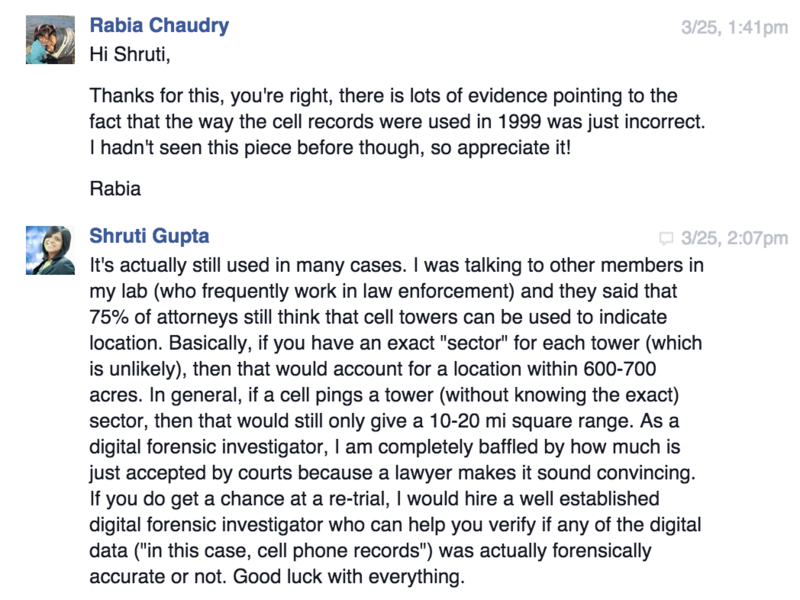 Then there are the folks who reach out randomly, to offer tips and advice, bothered by what they see in the case. Like this doctoral student from Purdue, who shared this article about the uselessness of cell tower pings in tracking the phone itself. I get to travel and do talks across the country as the face of the campaign to help free Adnan – but behind me are all these incredible folks. I am at a loss for words to express my gratitude to all of these people, strangers who never met Adnan or me before Serial, who have gone above and beyond to help bring him home in ways I could never have imagined. I thank you and pray that your lives be full of blessings, peace, joy, and that your compassion is returned to you ten-fold, nay, a hundred-fold. You are angels. My heart runneth over. I cannot not mention Susan Simpson and Colin Miller, attorneys who have independently taken it upon themselves to investigate Adnan’s case, from the existing documents and evidence, to legal issues, to piecing together not just what went wrong in the case, but what actually happened on January 13, 1999. They have spent dozens and dozens (if not hundreds) of hours poring through the documents, finding new information or angles to think about, and blogging. Who was the last person to see Hae alive at school? Colin speculates it may have been a girl named Kera, someone we have no police statements for. Debbie mentions Kera in her police statement, but I think Debbie is getting her days mixed up. Which is a big problem for many of the witnesses it seems. In this post, at the end, Colin explains how they all can’t be right about what they remember about January 13th, 1999. The reason I think Debbie is not remembering her chat with Hae on the right day is that she recalls her wearing jeans. But Hae’s body was found wearing a black skirt. Which seems to match Inez Butler’s statement. Also Debbie says Adnan was late to school that day, but Krista distinctly remembers him being on time. Another concern with the witness statements in this case is that they could be mixing up different dates, remembering a bit from one day, a bit from another. So while some things they recall actually did happen on the 13th, others didn’t. In other words, maybe Debbie did actually talk to Hae with a person named Kera shortly before Hae disappeared, but she’s remembering her clothes and Adnan’s tardiness from another day. Who knows? Frustrating? Very. Even more so knowing the police, had they interviewed students and teachers immediately in the days after Hae disappeared in connection with their missing person’s investigation, instead of wait weeks and months to do so, we would have much more sound, consistent information and avoided the clusterf&*$# of contradictions we now have to deal with. Woodlawn High had only 8 days of school from Jan 1-Jan 24: Colin further breaks down Debbie’s statements according to what dates Adnan was in school and what dates there was track practice/meets. It also minimizes the dates that many of the interactions witnesses recounted could have happened. There was no broken windshield wiper in Hae’s car, aka she probably wasn’t killed there: What can I say. Just read it. Another dropped ball by Gutierrez, more smudging of facts by police and prosecutors. The police gave Don a big fat pass: Susan examines what all the police didn’t do in investigating Don, who would have been as natural an initial suspect as anyone. More so because he had apparently assaulted Debbie at some point and its unclear if he was actually working on the 13th. There was no wrestling match on Jan 13th: Big oops on the part of pretty much everyone. All those witnesses who said she had a match that day? Wrong. From what we know of how Hae was dressed when her body was found, a black skirt, pantyhose, a nice blouse, it seems she may have been planning on seeing Don. One black heel was found in her car. I’m no victimologist, but these are the types of clues they look at to determine what the victim may have been doing or where they may have been going, and the path their route may have taken. As stated by both experts, FBI profiler Clint Van Zandt and pathologist Dr. Bill Manion, on today’s MSNBC’s The Docket, there was simply nothing in the case to go on. In both of their estimations, its all about Jay. Not Adnan. From the autopsy, to the condition of the car – it’s clear that the story the prosecution told is not what actually happened. A poorly done investigation, hardly any established facts, and a witness who “sold his soul”. The case is totally unraveled. State of Maryland, your move. You want to listen to this. Oh yes you do. 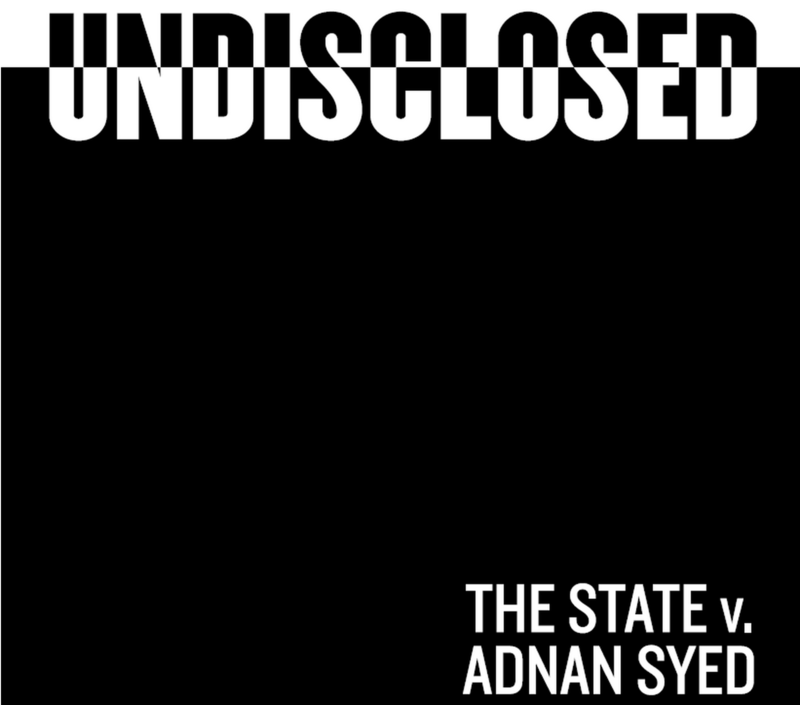 I am so very excited to announce the launch of our new podcast “Undisclosed: The State v. Adnan Syed”. By “our” I mean Susan Simpson, Colin Miller, and yours truly. Keep your eyes peeled in the next couple of weeks for our first episode, which you’ll find on the website (just a placeholder for now). Why a podcast? Well, as I traveled and did my talks I realized that most people who heard Serial stopped following the case there. Our podcast will pick up where Serial stopped off, with more in depth analysis, guest experts, and a closer look at the evidence and documents in the case. We hope people enjoy the ear-candy! You’ve been patient. You deserve goodies. Debbie Warren’s Full Statement – as promised, I said I’d share it if I found it. Found it. 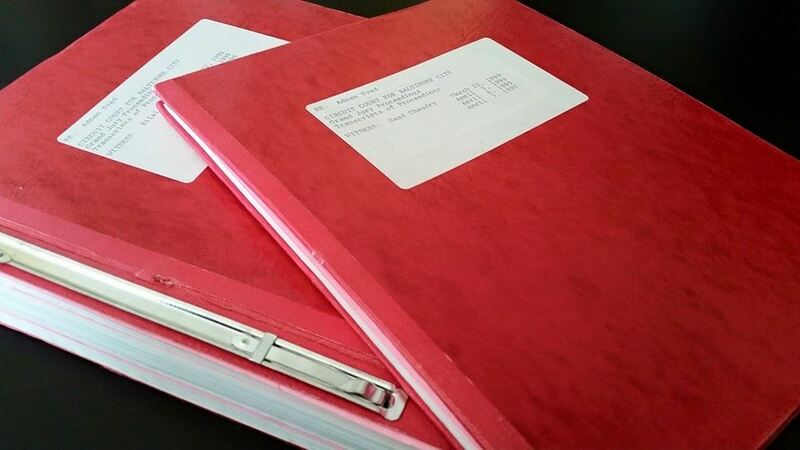 Full Grand Jury testimonies of Bilal and Saad. I suppose I could scan the hundreds of pages here. Maybe one day I will. Bilal’s Grand Jury Testimony – not the entire testimony, but the portion about his conversations with Adnan when he was first arrested. Some folks have demanded a more emotional response from Adnan, not realizing 16 years have gone by I guess and not realizing that they never heard all 50 hours or whatever of his convo with Sarah. So I thought this portion might be informative and provide those people with some much needed relief. They can all exhale now, knowing Adnan actually emotes. I may upload Bilal’s entire testimony at some point, not that there is much of substance other than a lot of exploration on Islam and what it says about dating. FML. The all star cast is here. We will finally get to hear the “hurnhs”, “urnhurns”, and “mmhurns” in their full glory and unfiltered. 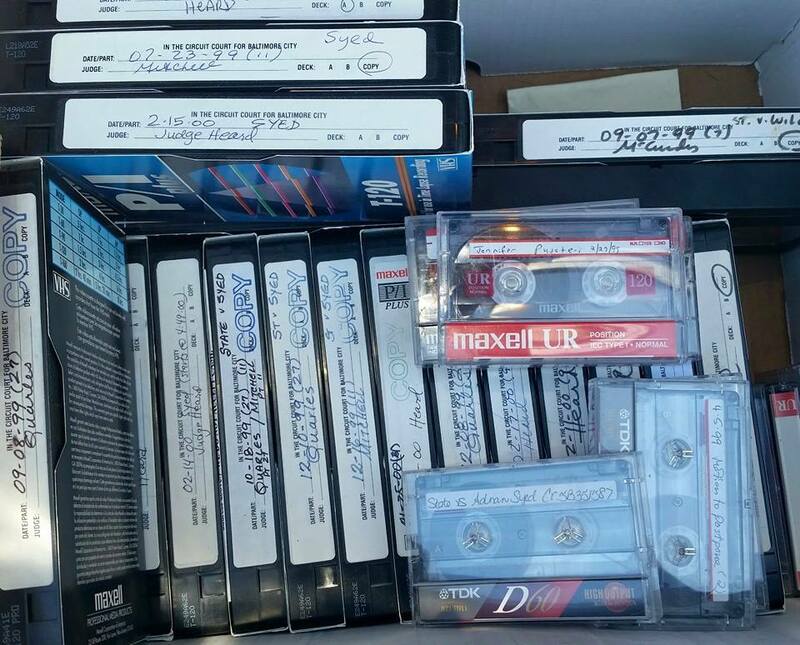 I now have the audio and video tapes of the interviews and trial. Mmmm, good stuff. Will be using the audio in the podcast, so stay tuned. As for the video…we’ll see.